Workplace harassment is an issue that often goes unreported by victims or bystanders. Many studies report that as many as 85% of women have experienced some form of sexual harassment at work. Join us for a conversation about gender discrimination at work! Our speakers will be discussing the meaning of gender bias and what it looks like, intentional discrimination, implicit bias, and more. We'll also be discussing work-life balance, and how women can empower each other personally and professionally. - Opportunity to connect with other attendees. Over two years ago on January 21 2017, 6 million women and allies sparked an unforgettable movement around the world. The Victoria chapter of the Women's March has organized events since 2017. For International Women's Day 2019, join us for a conversation about the future of the Victoria chapter of the Women's March, with the new leaders of the organization. Attendees will have an opportunity to participate in a conversation about the future of the Victoria Women's March while enjoying dinner and meeting other community members. - In depth conversation with the leaders of the Victoria Women's March about race, gender, change of leadership, and the future of the organization. The event is hosted by the Support Network for Indigenous Women & Women of Colour (SNIWWOC), and the University of Victoria Women's Centre. The venue is wheel-chair accessible. This event is free and open to the public. Please RSVP to let us know you'll be joining us! For dietary restrictions, please contact info@sniwwoc.ca. Food With A Side of Community is a casual community dinner that takes place every month. We believe in creating safe spaces for women to heal and connect with each other through food and conversations. Join us for a conversation about the intersections of race, mental wellness, and mental illness. We'll also be discussing the impact of history on mental health, strength in identity, simple self care techniques, and tools to rewrite detrimental narratives. 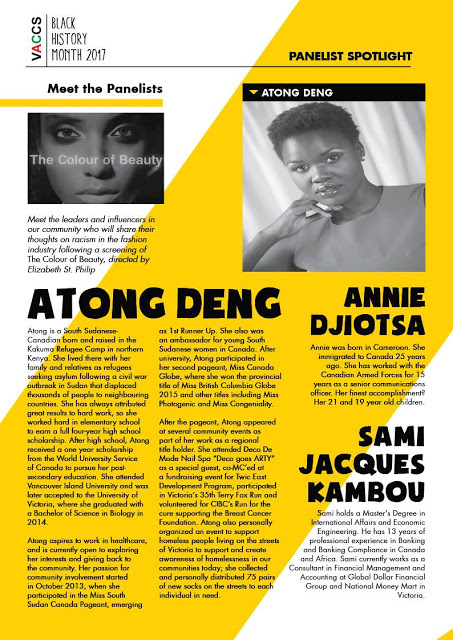 The event is hosted by the Support Network for Indigenous Women & Women of Colour (SNIWWOC), the Victoria African & Caribbean Cultural Society, and the University of Victoria Women's Centre. Join us for a casual holiday gathering featuring delicious holiday dinner featuring delicious soul food from Southern US, and local musicians. Food With A Side of Community is a casual community dinner that takes place on the first Thursday of every month. We believe in the power of food and conversation to build relationships. Join us for our community gathering including dinner and featured guest speakers. This event is happening on the traditional occupied territory of the Coast Salish peoples, specifically the Lkwungen nation. The Public Library is wheelchair accessible. The event is organized by the Support Network for Indigenous Women & Women of Colour and the University of Victoria Womens Centre. For November's monthly dinner, Dr. Waaseyaa’sin Christine Sy will share her experiences navigating intersectional discrimination in the BC School System. Drawing from her background as a parent and educator, she will also discuss how educators can better equip themselves to engage with and support racialized students in the classroom. 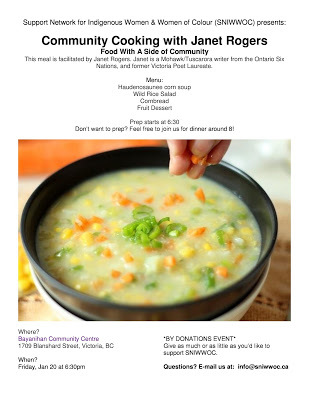 Food With A Side of Community is a community dinner that takes place on the first Thursday of every month, in the downtown Greater Victoria Public Library (Community Room). We believe in the power of food and conversation to build relationships. Join us for our community gathering including dinner and featured guest speakers. 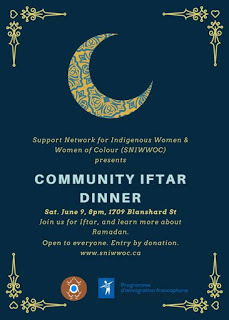 The Support Network for Indigenous Women and Women of Colour (SNIWWOC) is hosting the SNIWWOC Reproductive Health Fundraiser, a cocktail hour raise funds and support our programming, resources, and events. The cocktail hour will be hosted by Anu Lotay with a silent auction, signature drinks, and entertainment. The SNIWWOC reproductive health fundraiser will feature speeches from Mayor Lisa Helps, and other reproductive justice advocates and showcase local music acts and art. Join us on October 6th and support SNIWWOC's efforts to continue advocating for women's health through art community, and education. Can't make it? Donate through our fundraising page: www.sniwwoc.ca/donate. We acknowledge that our organization is based on the traditional unceded territory of the Coast Salish peoples, specifically the Esquimalt and Songhees Nations. Victoria's biggest evening of Burlesque! Our beautiful glitter community is coming together to perform for the cameras, and raise money for a good cause while we're at it. The most jam-packed and diverse evening of burlesque you'll see all year. * Washrooms are for all genders. Marwo shares her journey raising funds to bring her family members to Canada through a private sponsorship arrangement. Currently, the 4 family members are UNHCR convention refugees residing at a refugee camp in Kampala, Uganda. Learn about the food struggles faced by Indonesian women working as domestic workers in Singapore. Our guest speaker is UVic Anthropology MA student, Charlene Mohammed. Sharing a meal allows people to build community by learning about each other, our histories, and our stories. Spoken word poetry is another way we share stories, experiences and learn from one another. We'll be listening to a few poets before and after the meal to share, inspire, connect, and spark dialogue. Iftar is the meal eaten by Muslims after sunset during Ramadan. We'll have lots of delicious food available. Open to everyone. Please invite your friends. Bus tickets avaialable. Email info@sniwwoc.ca with accessibility requests and dietary restrictions. This event is happening on the traditional occupied territory of the Coast Salish peoples, specifically the Lkwungen nation. The Community Center is wheelchair accessible. This month's dinner focuses on "A Suitable Girl", a film by Sarita Khurana & Smriti Mundhra. Join us for a meal, movie screening and a conversation about gender, matchmaking and arranged marriages in India. Food With A Side of Community is a community dinner that takes place once a month. Bus tickets provided. Email: info@sniwwoc.ca with accessibility requests and dietary restrictions. For our monthly dinner series, join us for a meal and a conversation about reproductive rights, birth (to have babies or not), career implications, parenting, community support and resources, and more! The conversation will feature various experts including academics, doulas, and community organizations. The event is open to everyone. For many women, talking about reproductive rights and finding adequate resources can be a very isolating process. Additionally, immigrant women aged 25 or older are less likely to self-rate their overall health as very good or excellent compared with the Canadian-born. The event is organized by the Support Network for Indigenous Women & Women of Colour and the University of Victoria Womens Centre. 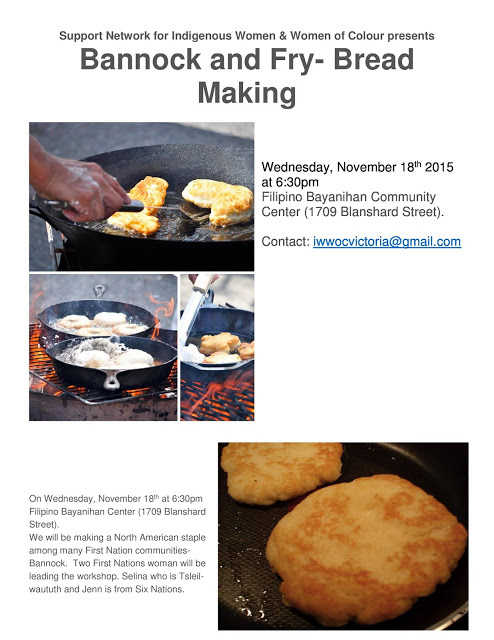 Food With A Side of Community is a community dinner that takes place once a month at the Bayanihan Community Center. Join us for an informal community dinner as we celebrate Black History Month!! We have partnered with the Victoria African & Caribbean Cultural Society to serve delicious food from the West African country, Cameroon. We'll also have live performances by local artists. $5-$10. But we encourage you to pay what you can. Nobody turned away for lack of funds. Marwo Abdi's family is seeking refuge in Canada. The family is originally from Somalia, but is currently residing at a refugee camp in Kampala, Uganda. Come for dinner and help us raise money for the Kalmo Refugee Support Group's application to the Private Sponsorship of Refugees Program and support this family reunion. Please share widely. Coming together to prepare a meal and eat together allows people to build community by learning about each other, our histories, cultures, and our stories. On Friday, December 15, join us as we share Christmas treats from countries across the world! Attendees can expect a 3 course meal. Co-organized by the Support Network for Indigenous Women & Women of Colour and the University of Victoria Womens Centre. Food With A Side of Community takes place once a month at the Bayanihan Community Center. Boma Brown, a founding member of SNIWWOC will be speaking at this event on Tuesday, June 6 in City Hall! Join us for the 2nd annual CRFAIR Food Hubs Roundtable! This event is an opportunity for organizations and businesses that work towards food security to share resources, celebrate success stories, and create strategies for food systems change. At last year's roundtable 40 organizations gathered to begin a conversation about how to increase food access and food literacy at the neighbourhood level. This year, we want to build on the excitement about neighbourhood food hubs and strengthen relationships in order to foster food security in the Capital Region. We will set the scene by presenting how we have collectively grown over the last year and identify areas for potential growth. Please email us other topics of interest that you may have so we can include them in the roundtable discussions. Please bring resources to share! We will be hosting a resource table for everyone to enjoy for the duration of the event. On the first day of Ramadan, stop by for some delicious food! Coming together to prepare a meal and eat together allows people to build community by learning about each other, our histories, and our stories. Montaser will be cooking the meal. Meal from Syria (Makloba, Fatoosh, and Soup). Organized by the Support Network for Indigenous Women & Women of Colour. Bus tickets provided. Email: info@sniwwoc.ca with accessibility requests and dietary restrictions. 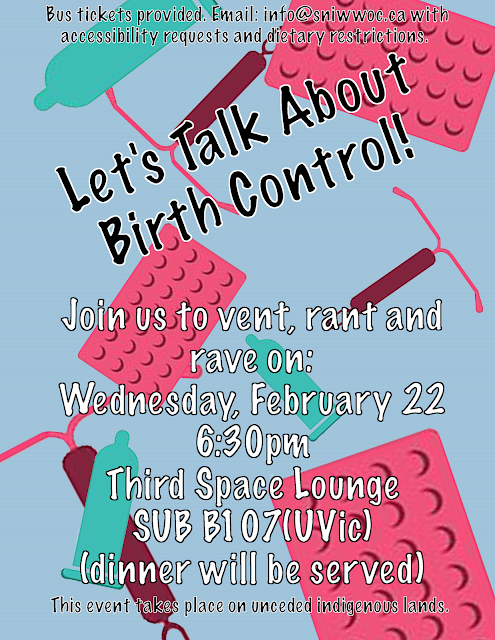 The Support Network for Indigenous Women & Women of Colour (SNIWWOC) is happy to team up with UVic's Third Space (formerly the Women's Centre) for an informal conversation about birth control and navigating the healthcare system. Why is it so expensive? Why is it so stigmatized to talk about? What are the current effects of the racist history of birth control? Where do non binary and trans people fit into a conversation about birth control? This event is happening on the traditional occupied territory of the Coast Salish peoples, specifically the Lkwungen nation. The Upper Lounge is wheelchair accessible. Boma Brown, SNIWWOC's Director, is moderating this panel discussion on Saturday, February 18. For this month's Valentine special, join us for some pho (made by Trison) and chocolate treats. Organized by the Support Network for Indigenous Women & Women of Colour. Food With A Side of Community takes place once a month at the Bayanihan Community Center. On Friday, December 9, join us as we share Christmas treats from countries across the world! Attendees can expect a 3 course meal. Mohawk poet Janet Rogers will read selected pieces from her recently released poetry collection Totem Poles and Railroads as well as share some spoken word. Every month, we host a free community dinner called 'Food With A Side of Community'. On August 27, we're taking it outside. Free dinner, music, live performances, and activities! Email us to RSVP for dinner! This event is happening on the traditional occupied territory of the Coast Salish peoples, specifically the Lekwungen nation. Norma, one of the board members of the Bayanihan Cultural and Housing Society, will be facilitating. We'll be preparing chicken adobo but will have other vegetarian options as well! Bus tickets provided. Email: iwwocvictoria@gmail.com with accessibility requests and dietary restrictions. Thank you to Vancouver Island Public Interest Research Group (VIPIRG) for their support! Come join us as we explore food, identity, community, and reproductive justice! Wondering what these two sports events have to do with mining injustice, gentrification, poverty, homelessness, and displacement? Come learn more and engage in an interactive session with local community organizers. Let's talk about what's happening beyond the spectacle of major sporting events. We'll be chatting about these games, but with a spotlight on Victoria, BC. Winners at the PanAm/Parapan Am games are awarded medals supplied by Barrick Gold, a company responsible for murders, sexual violence, and violations of Indigenous sovereignty. Billions of dollars are poured into a sporting event for a few weeks when the focus could be on marginalized members of the community. Have you heard about the North American Indigenous Games? Where was the nationwide media hype for that? Light snacks provided. Bus tickets available. Please inform us of any accessibility needs you may have. Part One: Who Am I and the Power of "I" Mahlikah will share her piece "sovereign territory" to open up a discussion on the workshop theme in a sharing circle. In pairs or tri-ads participants will develop an I AM Poem utilizing affirming prompts to explore their thoughts, feelings and perspectives on what it means to be a womyn. Mahlikah shares medicine wheel teachings around self and the power of "I". Part Two: Four Directions of Wellbeing Mahlikah shares the connection between the four directions of well being (body; heart; mind and spirit) and the impact of the extractive industries on womyn. Participants will engage in a Gallery Walk Exercise responding to visual images by indigenous artists; proverbs from our indigenous ancestors; testimonies from indigenous women and the declaration for the health, life and the defense of our lands, rights and future generations. Part Three: Collective Slam Piece Creations inspired by our Gallery Walk Lyrical Narrative Webbing and closing Sharing Circle. Quadra Village Community Center (901 Kings Road) . Join us as we talk about reproductive health, gender identity, and art! We'll be painting a mural! Lunch and bus tickets provided! !